This first video is mostly about vocab, so we'll explain the terms "Unit Circle", "Reference Angle", "Standard Position", "Quadrants", "Terminal Side", and "Bowtie Angles". We'll do all this in degrees, not radians, because in my experience radians are way easier to deal with if you save them until after you've learned the unit circle in degrees. 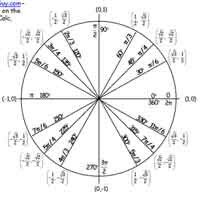 This unit circle stuff is bad enough on its own! These problems tend to be a lot easier than arc length because, well, sectors are boring. There aren't a lot of fancy word problems to play with. That said, there are a few tricks teachers can pull. Also, if you've got a standardized test coming up (SAT, GRE, etc. ), I'll show you how to do these problems in a simple, formula-free way. This video features some brutal examples which show how the Big Three proof tools can get you through even the diciest proofs. It also shows that even folks who are pretty good at trig don't necessarily see how to solve a proof when we begin; you just have to keep messing around until it gets there! If you're in honors, these trig proof examples are for you! The formula is so simple that there's only a few tricks a teacher can pull on an arc length without making it a word problem. Also, if you've got a standardized test coming up (SAT, GRE, etc. ), you probably won't remember the formula on test day, so I'll also show you how to do these problems in a simple, formula-free way.